Yesterday’s rain was welcome, but for this beehive, it was a bit much. 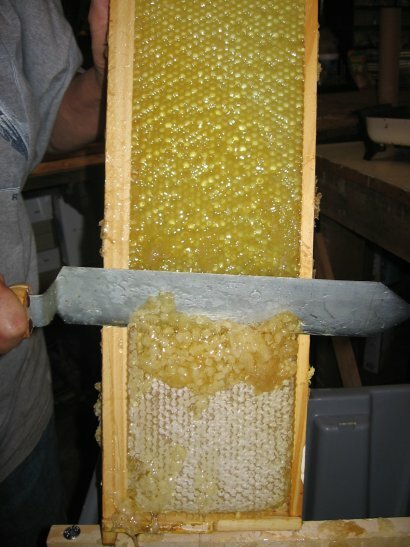 This is our most productive and hive with the most supers on it. 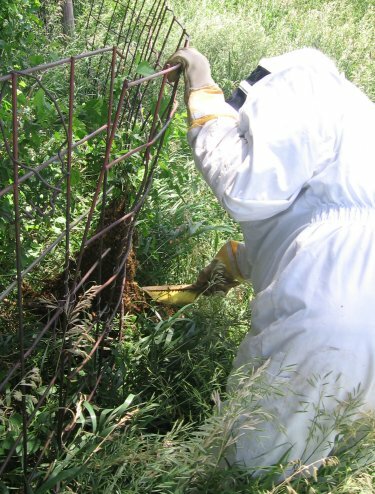 It’s at another farm and it was, shall we say, a bit delicate to put a hive back in place section by section. We took four supers that were full away, left the bottom few on and put an empty super on top. Needless to say it was a bit frightening to put this all back together with the hiving buzzing around, looking for a home. 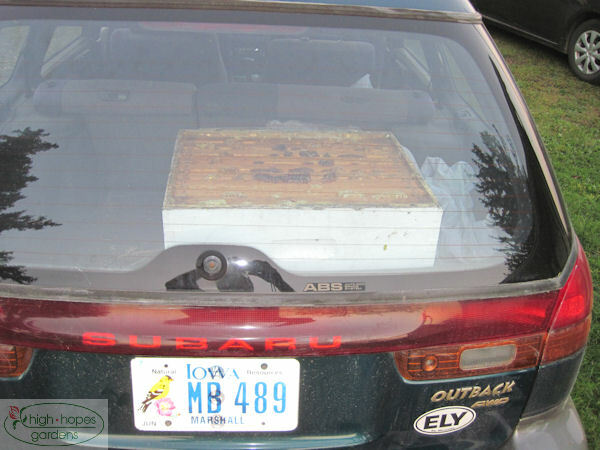 I brought a trailer along, and with the four supers we brought home, most of the bees blew off the 70 mph trip home. 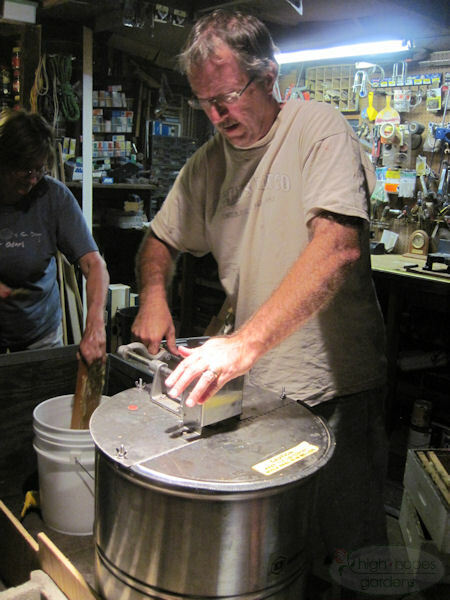 then we needed to secure the honey in a location that was airtight, so the remaining bees and any other neighborhood hives didn’t steal the frames – so, we pried the frames loose and put them all in giant coolers until we are ready to extract. Bees are fascinating little creatures. They are no doubt among the happiest creatures that spring has finally sprung. 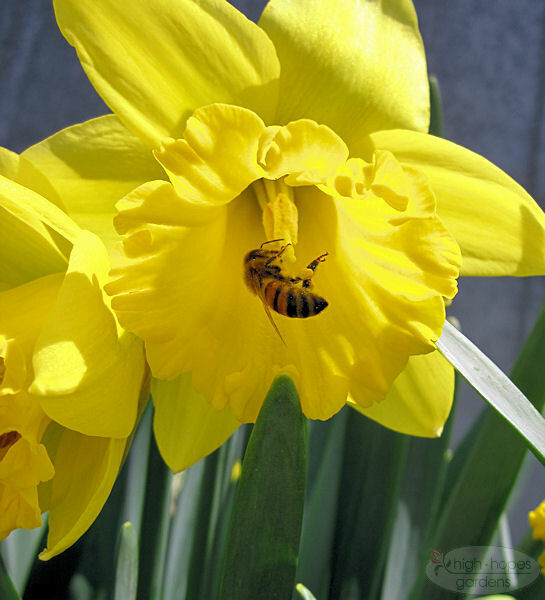 Here’s a bee gathering pollen from a daffodil. 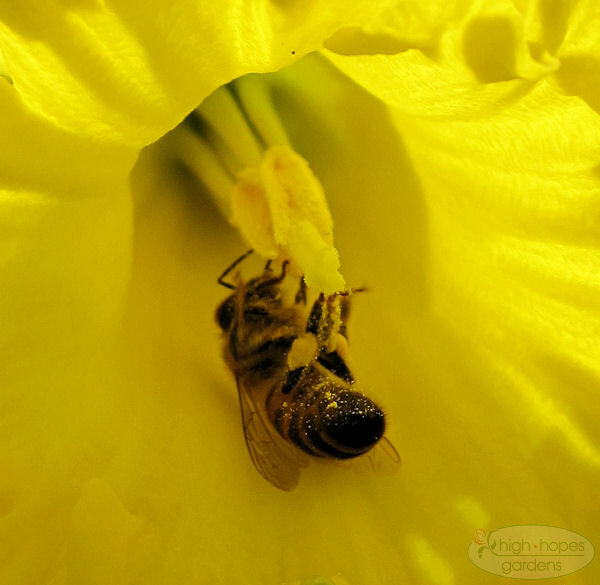 Notice the little yellow sacs on its legs where it collects the pollen. Here’s more of a close-up which shows the sacs a little better. 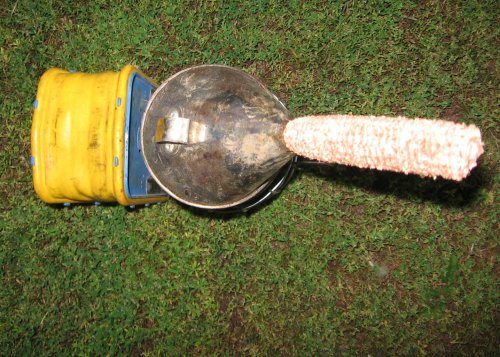 The pollen is the protein that makes the hive hum. There’s also busy on the first flowering tree, this plum. In this hot weather, the bees also have to keep busy. 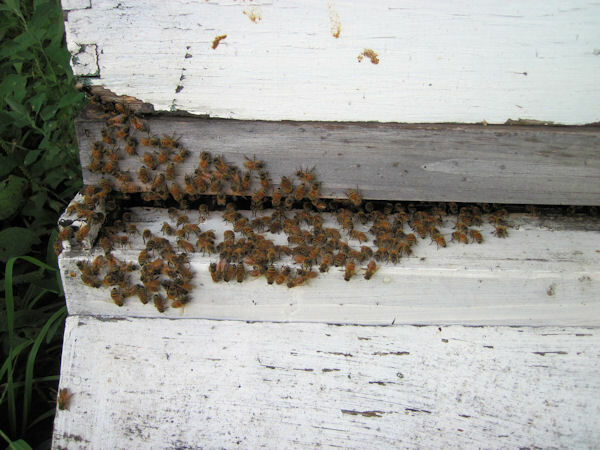 Here a bunch of them are hanging out on the front porch of the hive. When you are this close to the hive, it sounds a bit like the roar of a distant waterfall from the sound of the bees vibrating their wings to keep the hive cooler. 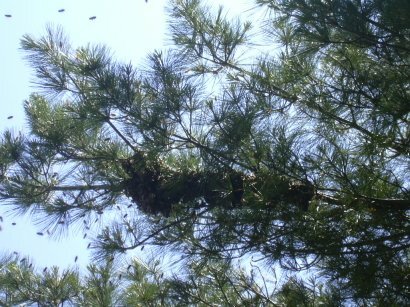 Although there’s never a good time for a bee swarm, the day they swarmed was a particularly bad time. We were running late getting flower and fruit orders out the door, running behind on starting to put the last 50 chickens to rest, and about to head to town to pick up the kids. We had about 5 minutes together to deal with this. 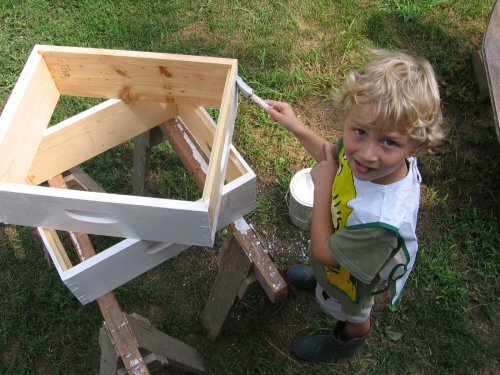 We set up a hive, got a box to catch the bees as they dropped after cutting the branch. We misjudged the size of the branch/swarm/box and when they fell, most of them missed the box. I had to head to town, and they reformed even higher up a tree and while Linda waited for me to return to figure out the best way to get the next branch cut, they flew away a few minutes before I got back home with the kids. It’s always disappointing to miss a chance at a “free” hive, but maybe next time we’ll have better luck! 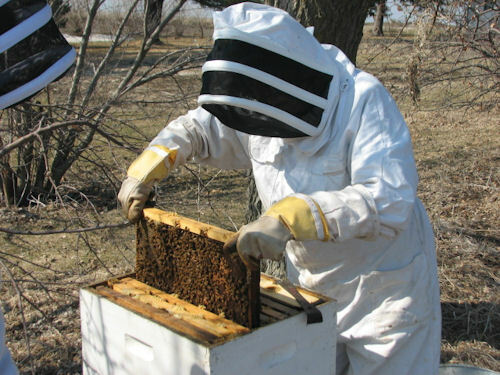 The spring beekeeping tasks are at hand. 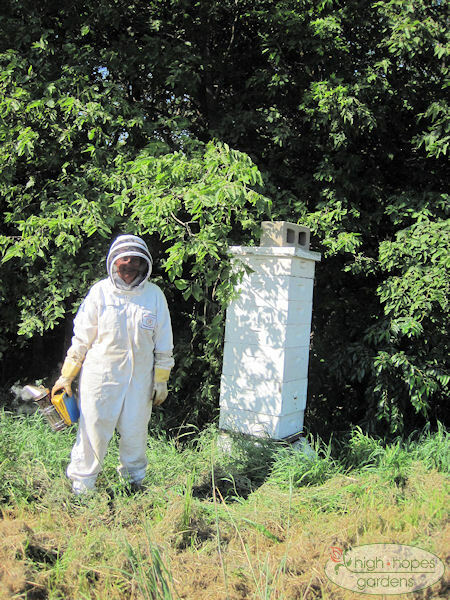 Two of the three hives needed to be rejuvenated this spring. 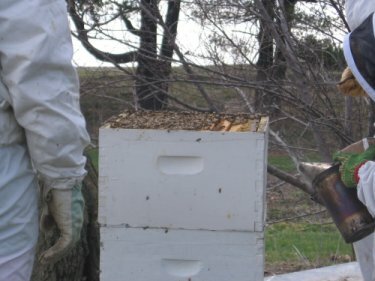 So two hives have new queens. 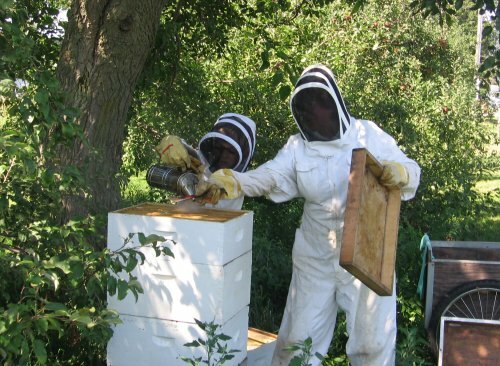 The new queens were put in the hives in mid-late April and now it’s time to check on how the hive is doing. 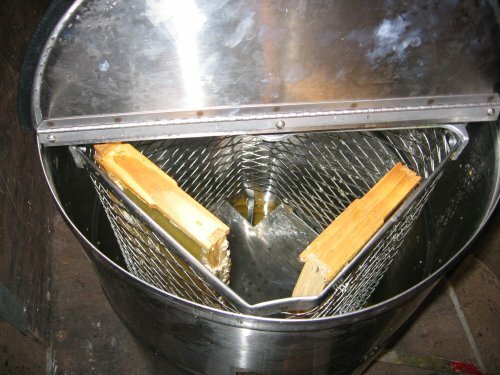 The smoker is ready in anticipation of opening the hive. 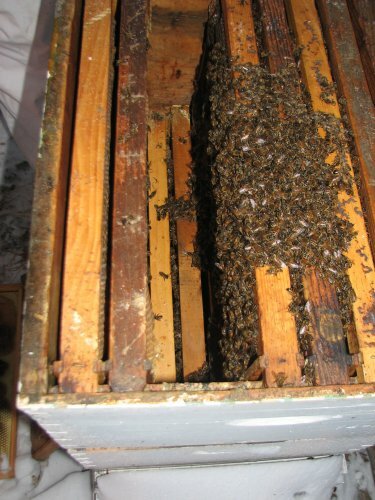 They are all off to a good start – with more brood cells and great hive activity – so the queens stuck around and are laying eggs. 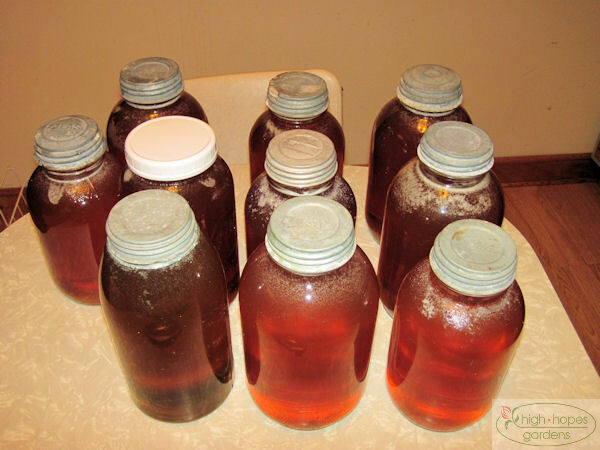 Now that the temps have warmed to the 50’s, it’s time to make sure the bees have enough honey left in the hive to sustain them until the first blooming commences. 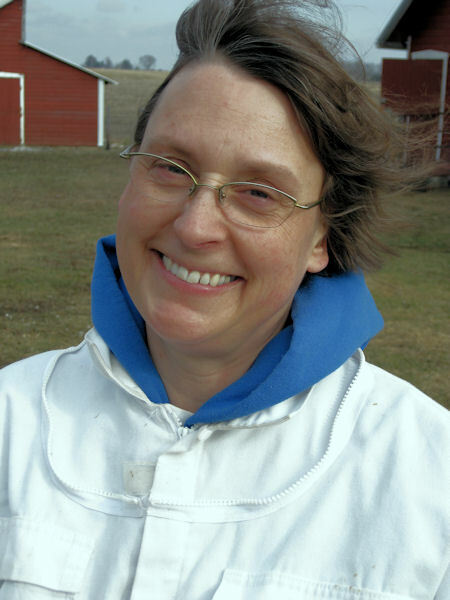 Linda is taking over the beekeeping this year. 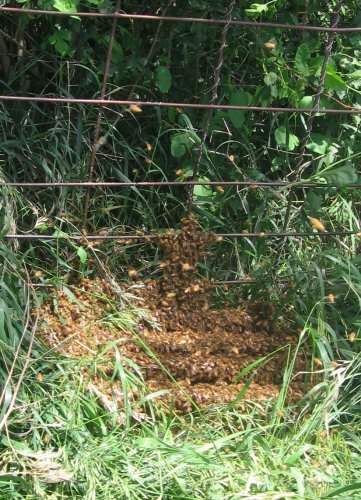 We were happy to see that this hive was still active after the winter. 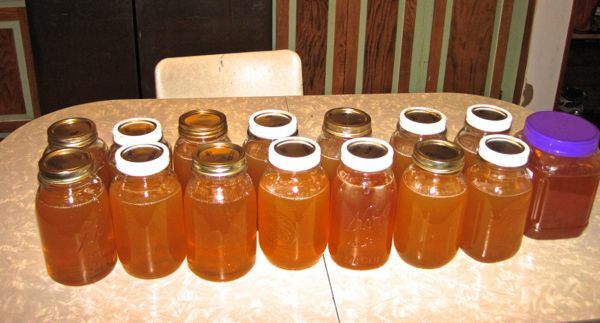 Today the black cover came off the hive and the honey supply looked adequate to keep them going. 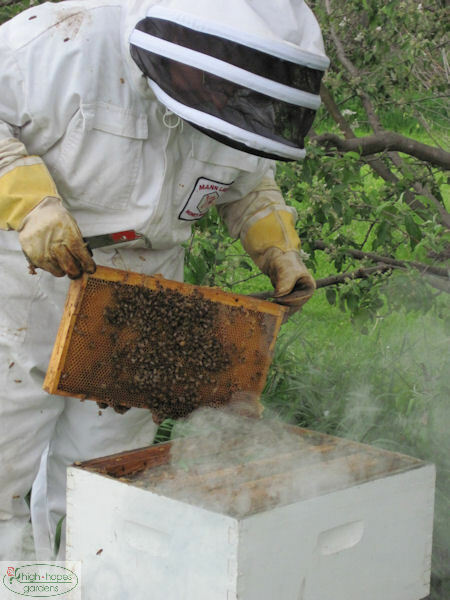 It’s time to tuck the bees in for the winter. By the end of this week, the highs are supposed to be in the 20s. 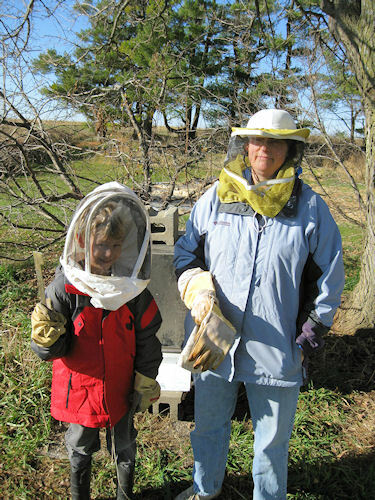 Martin and Linda add the insulated cover to the hive. 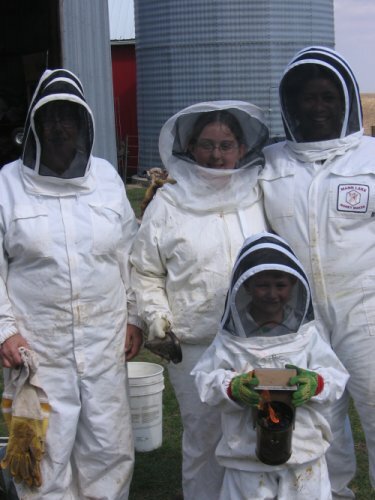 Here, they pose after finishing the job – the black cardboard has been slipped over the hive and we wait until spring to do anything else with the bees. 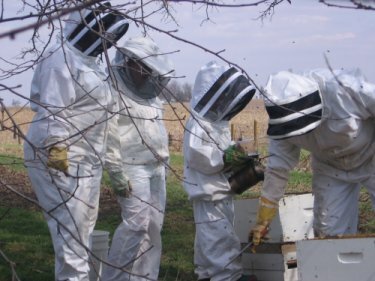 Martin and GJ brought their beekeeping show on the road this Sunday. 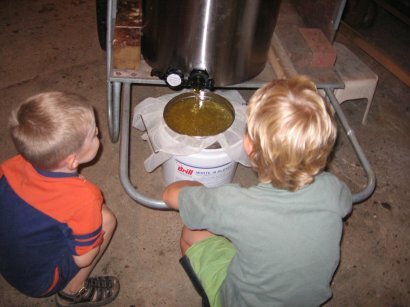 They brought some of the equipment to Martin’s Sunday School class and did a beekeeping demo. Here the kids keep clear as they are not convinced that the beehive is truly free of bees while Martin and GJ have their suits on to open the hive. 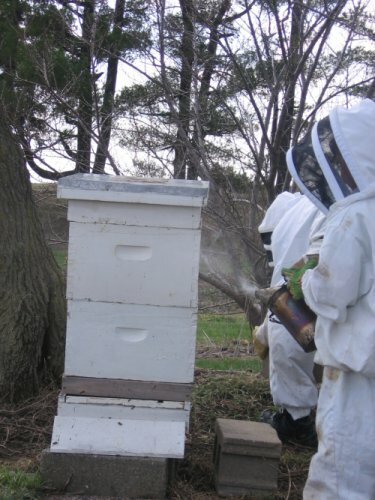 Another sign of spring is removing the winter protection from the bees. 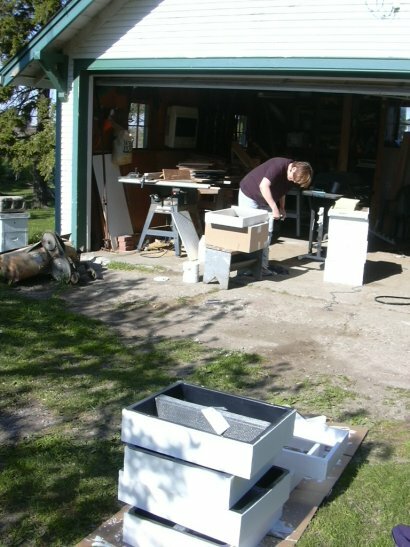 Here the black cardboard box that slides over the hive is removed. The black helps warm up the hive whenever the winter sun comes out. 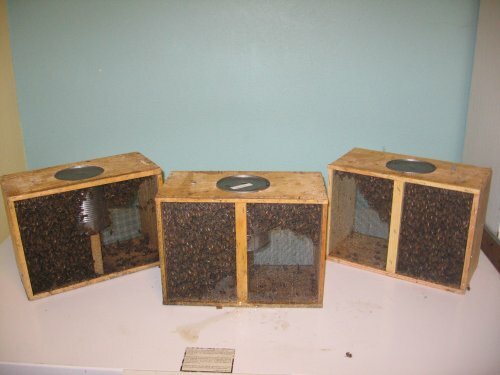 It is rather amazing to think of the bees surviving through the -20 lows and long cold days in the hive. 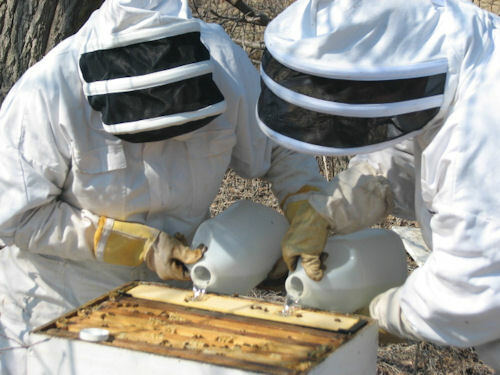 Now that the temps are in the 60’s and 70’s some days, but the flowers are not yet out, the bees are out and about and here they get a dose of sugar water to tide them over and some mite protection. Finally, a check to see if the queen is still alive and all we have to do now is wait for the spring pollen and flowers to arrive. 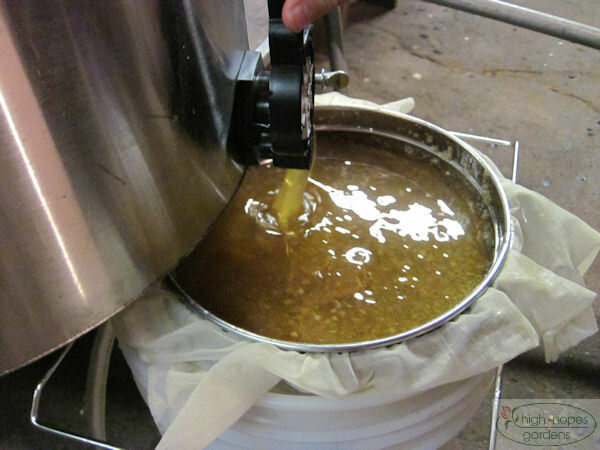 Today was honey extraction day. 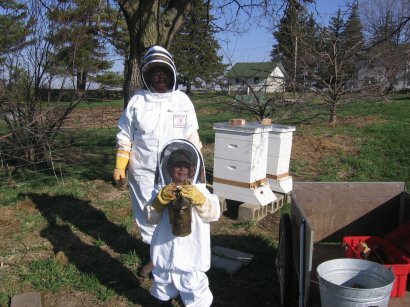 Martin, GJ, and Linda donned their beekeeper’s suits and robbed the honey. Here Martin helps smoke out the bees before GJ takes off a super. 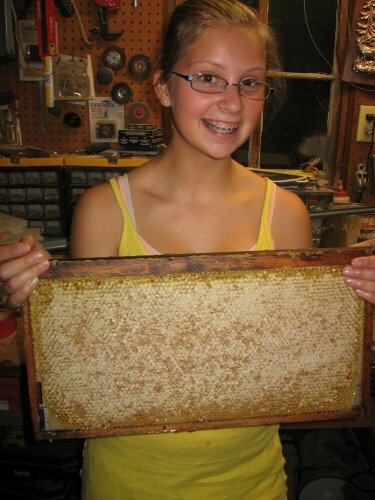 A beautiful frame full of honey. 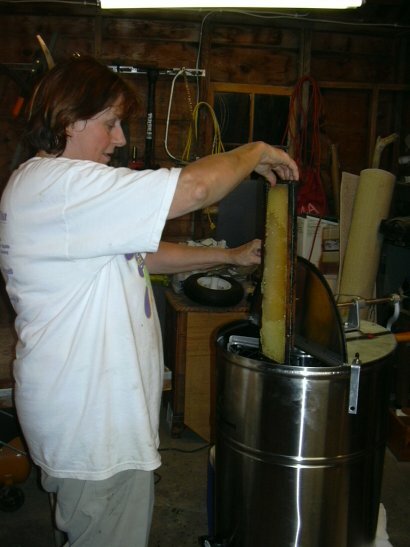 The newest addition to the honey extraction process is an electric uncapping knife – it worked spendidly removing the wax tops from the frames. Emma shows off an uncapped frame, ready for the extractor. We use a manual extractor, just put in four frames and turn the hand crank, wait for it to stop spinning, flip the frames around and repeat the spin. 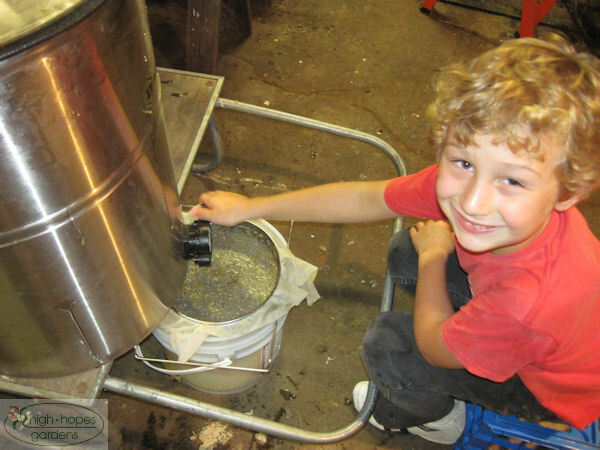 Martin’s job is to run the honey gate at the bottom of the extractor to filter the honey through a couple of filters. 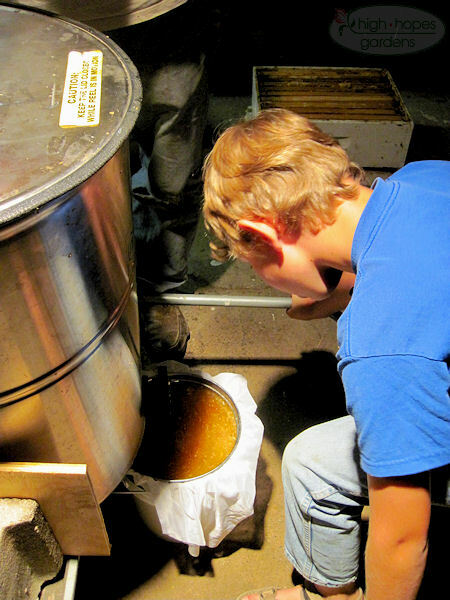 It’s always a hot job as the room should be 85-95 degrees to allow the honey to flow more freely through the extraction process. 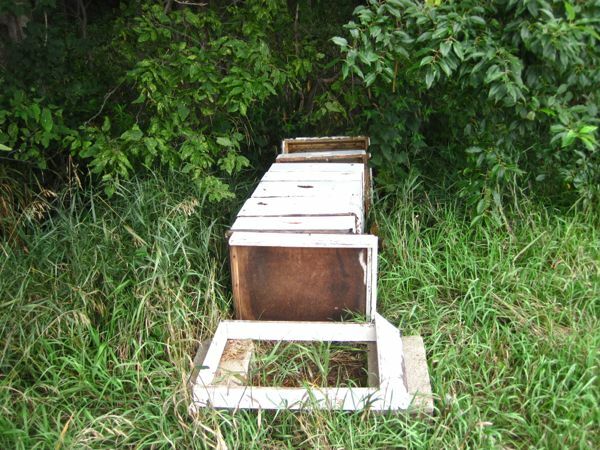 It’s time to replace the evil hive that was invited to fly away on a 3 degree morning and start some new hives. 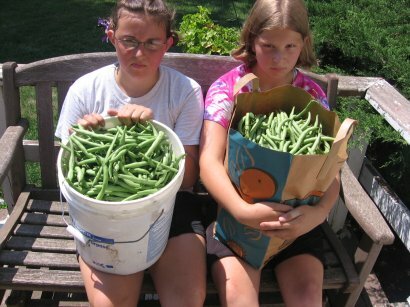 January 19, 2008 – Behave or Grandma Will Take You Out! 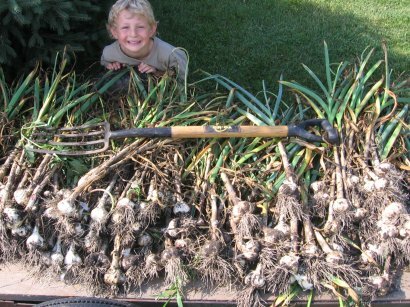 Finally, some farming pictures – outdoor farming pictures are few and far between during cold January weeks. 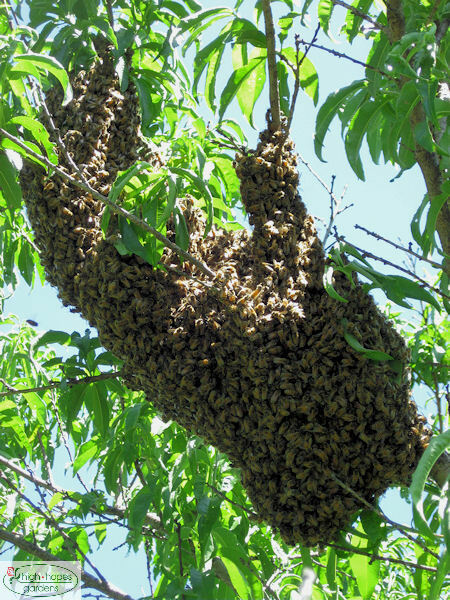 However, there is one beehive at high hopes that is very aggressive and gj is notÂ willing to work with overly aggressive bees. 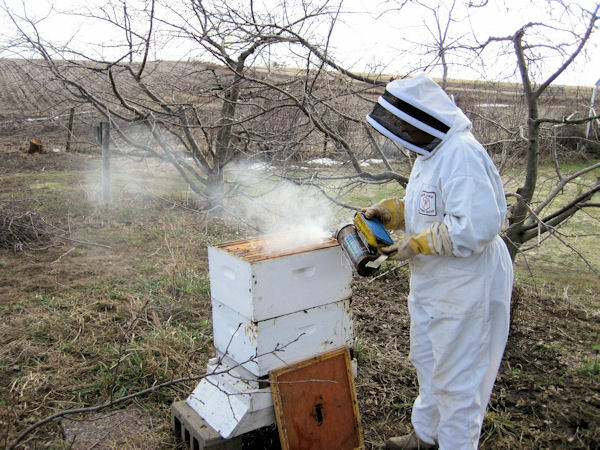 The solution is to go out on a cold morning and remove the bees. 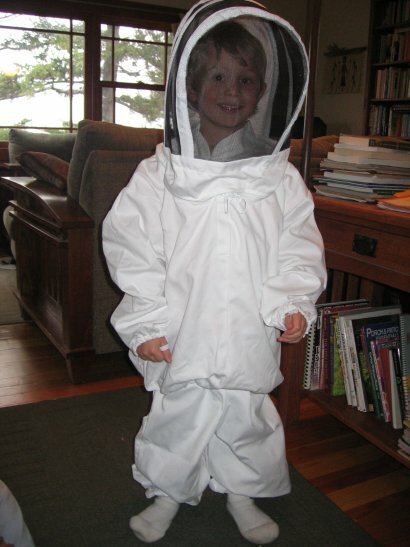 She wasn’t too sure how long the bees would live in the 3 degree morning, so she’s dressed in full beekeeping attire. 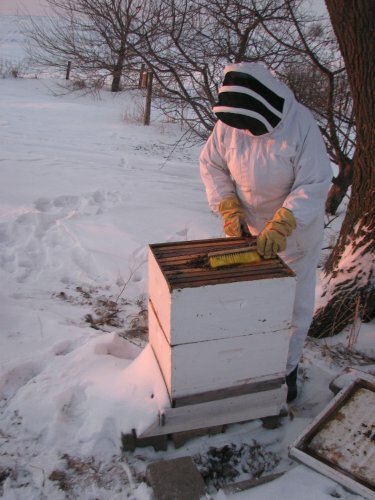 I bet you never thought that beekeeper’s attire worked well as winter camoflauge. 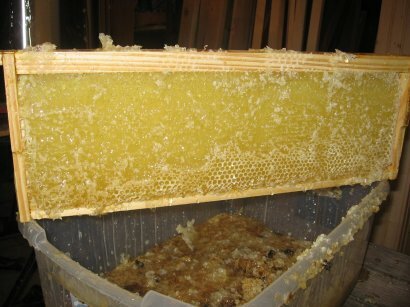 One frame is removed and the ball of bees is visible from in the hive. 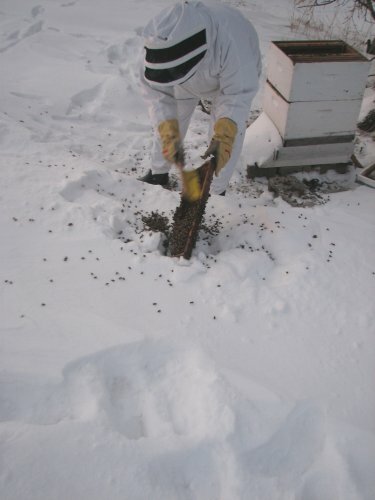 Scraping the bees off into the snow and cold air. 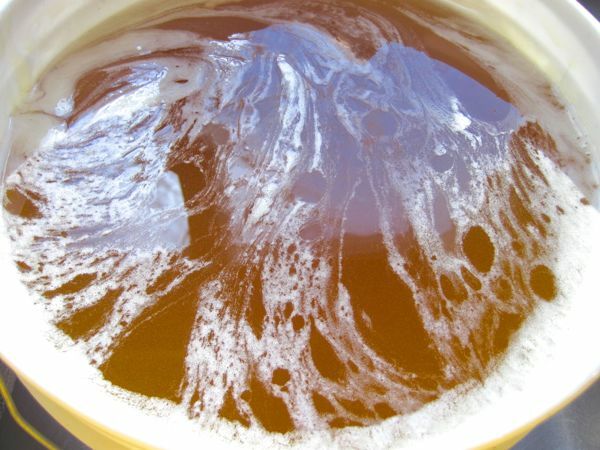 Some bees tried to fly away, but at 3 degrees the flight lasted about 5 seconds before they fell and perished. Next spring we’ll start over with a new queen and some buddies. You’re all probably as sick of the heat as me, so I won’t even go there. Things have slowed down over the past few weeks. 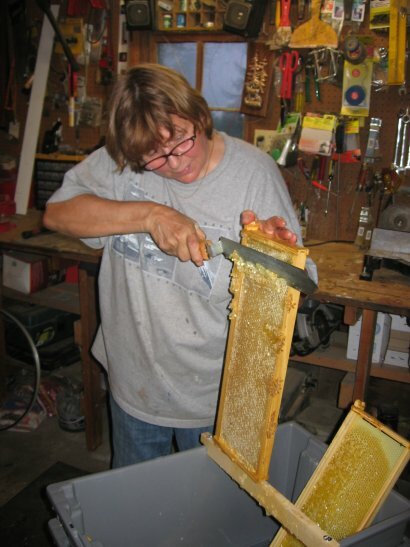 But today GJ got out to build some bee frames. 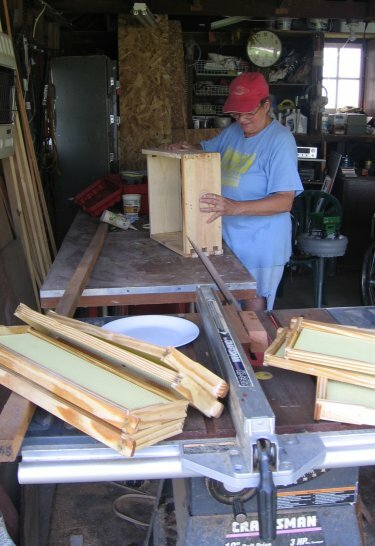 But today GJ got out to build some bee frames. It’s practically an assembly line with Martin to help paint! 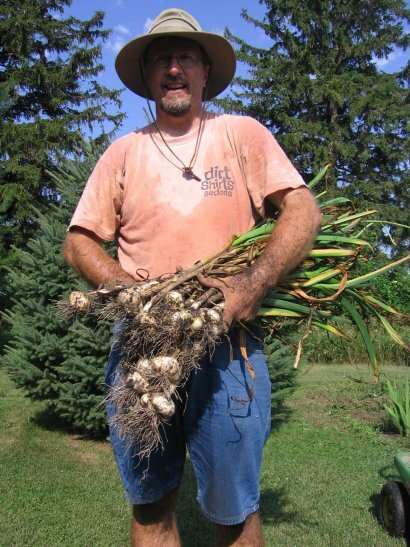 April 14, 2007 – Finally a Day! Today, we finally had a day that wasn’t cold or snowy! We were able to get a few things done outside. GJ dressed up a crowd to do some bee work. She brought her stepson from CA and a friend visiting from Fiji. Here is the crew and, of course, the youngest one gets to hold the fire! Marty leads the procession down to the hive. 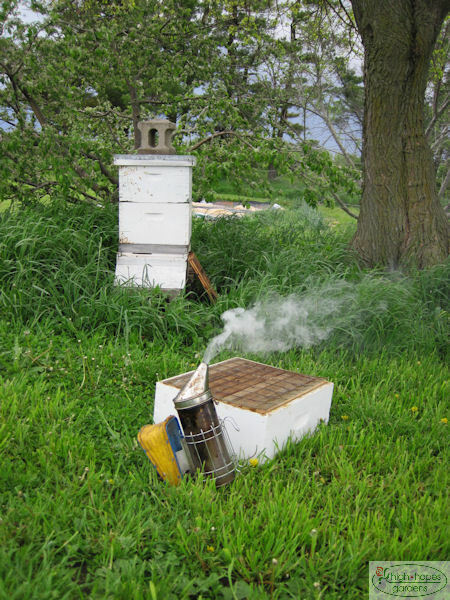 Smoking the hive to settle the bees before lifting off the lid. Yeah! 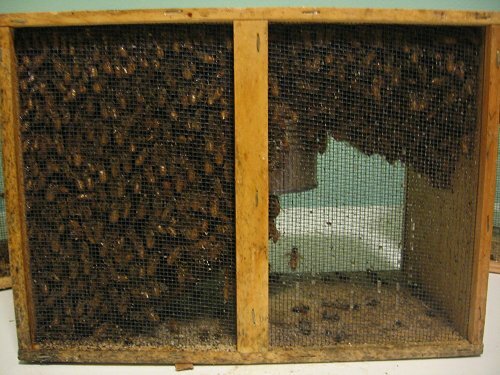 There’s still bees inside (that’s no longer something taken for granted). Linda got the first few things in the ground, although most of the garden is still to wet to work. 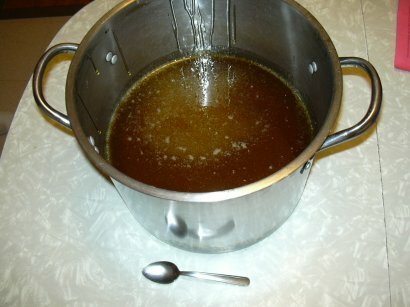 Today was honey extraction day. 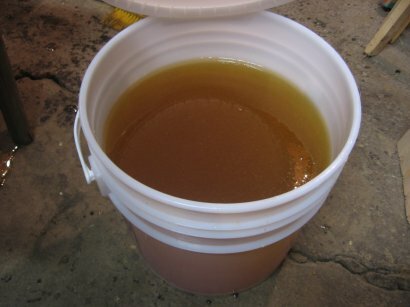 We went out in mid-afternoon to rob the honey from the hives while many of the bees were out foraging, loaded the frames in the back of the truck and parked it a distance from the house, so the bees wouldn’t find it and start stealing the honey back. 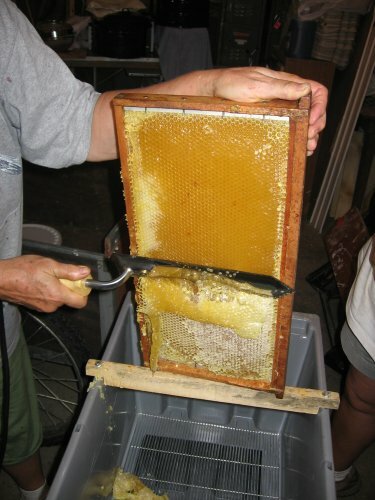 After the bees went to bed for the night, we drove the truck back and started extracting. The weather had just changed, and our near 80 degree day switched wind directions and dropped to the 50’s. 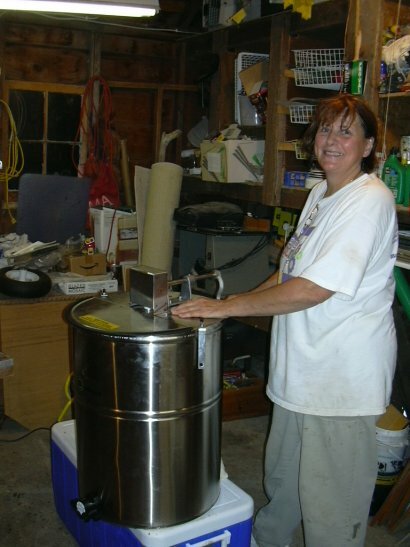 We started the heater in the garage to make sure it was warm enough for the honey to flow. The first step is “uncapping” the frames. Here’s a beautiful full frame with the caps partially cut off. 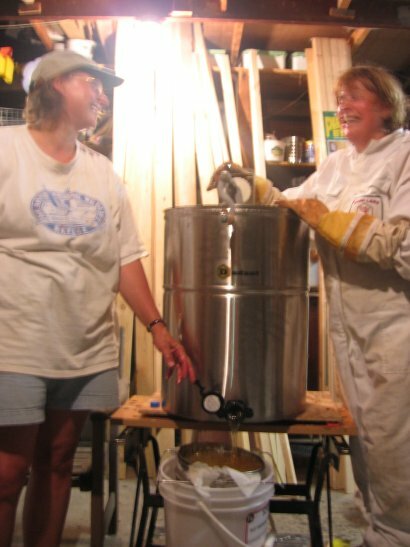 The neighbors wanted to see the process, so they came over and here Marty and a visitor are in charge of the honey gate. The hot steamy garage and cool damp, dark outdoors made for a delightful contrast. Now that spring is here and things are starting to bloom all over, the bees are out in force after waiting patiently all winter. 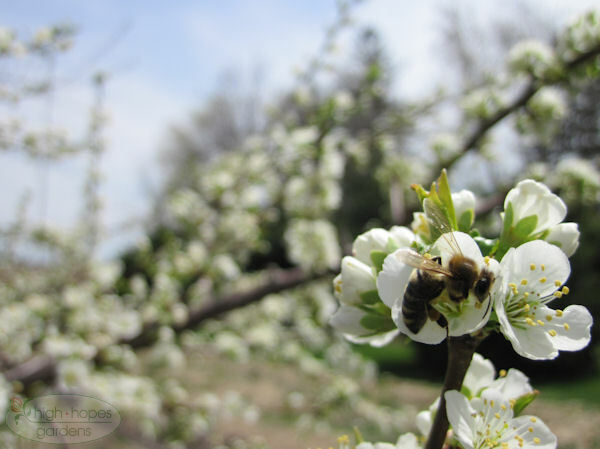 Here’s a bee on a plum tree. 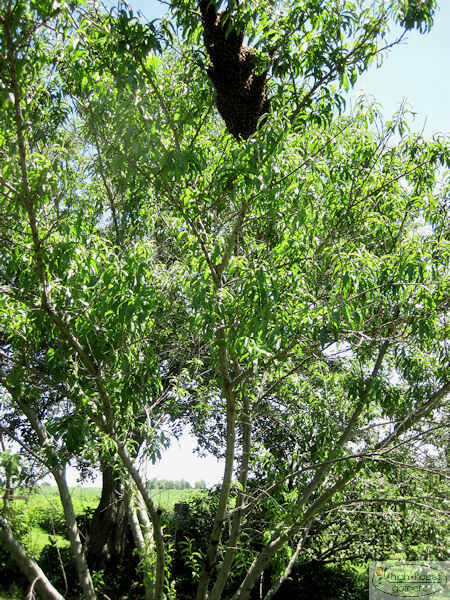 The tree was abuzz with insects, mostly on the lee side of the tree to stay out of the wind. The unbottled fragrance spilled downwind from the tree. 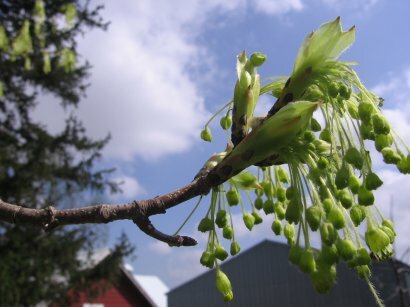 Even the less showy maple flowers were attracting the bees, although not in this picture. 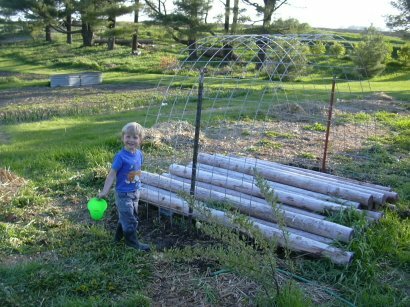 Today, we took care of unfinished business – got the rest of the fence up by the trees and fixed fences that had fallen around some of the chestnuts in the pasture. 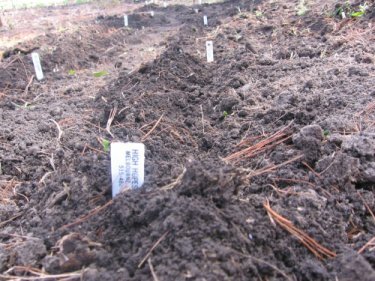 Finished planting the potatoes. 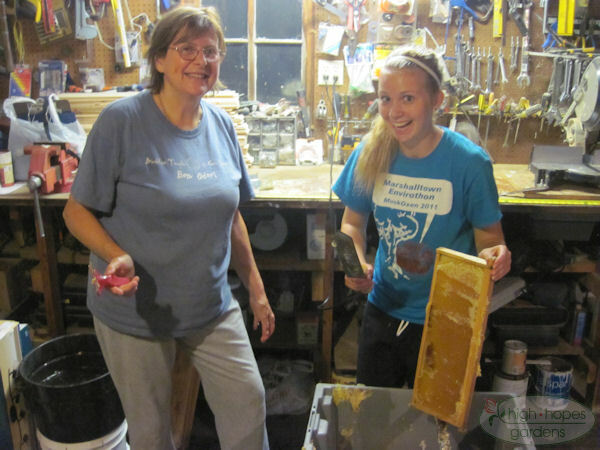 This morning Grandma Jo and Martin administered bee medicine to the hives. 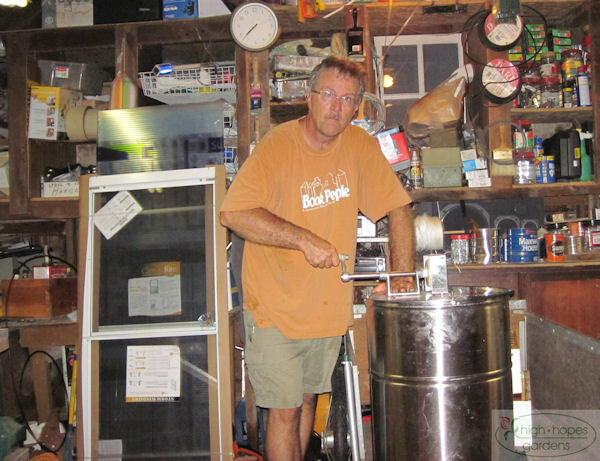 Martin operates the smoker to get ready to open the hives. Our good neighbor planted a buffer of 24 feet of oats/hay around our farm on the land he rents. So now both of us can worry a little less about drift. Took a load to the dump – wasn’t pleasant as the dump pile was upwind from the unloading area and the strong south wind brought 78 degrees. As long as we were in the hauling mode, we went to town and scrounged for cardboard for more grass killing/mulch for part of the garden. Martin and I went for a little hike in a nearby woods. We found an old garbage dump in one part and found some “treasures” for our neighbor Nancy – a cobalt blue bottle, an amber apothecary-type bottle with black lid, and what looks like an old lampshade, only made of heavy metal. We also saw squirrels and the first spring flowers. Today as I was mowing the yard in a break in the rain, I noticed a cloud of insects up ahead, like a big group of something had just hatched. 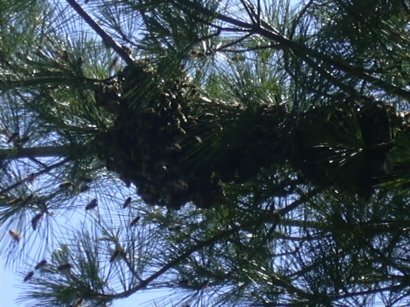 As I got closer, I saw they were bees and realized it was a bee swarm. 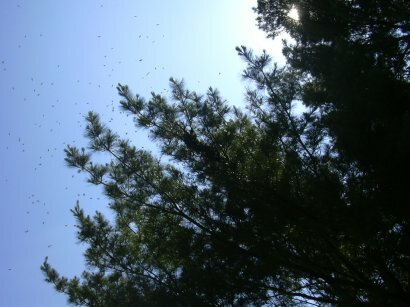 Watching the bees swarm is like a train wreck – it’s not something you want to see, but can’t take your eyes off. 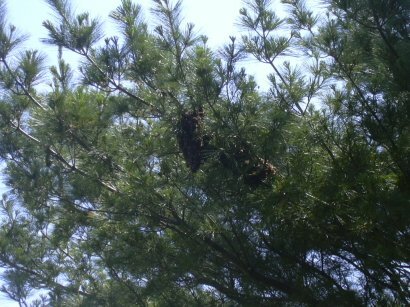 They started to swarm on a white pine branch about 15-20 feet off the ground. 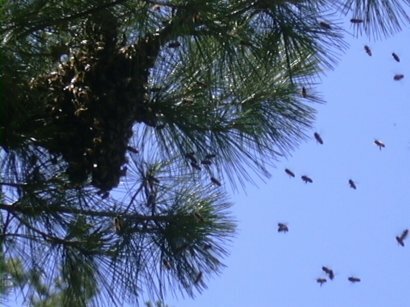 You can see that just a few have started to mass on a branch near the top of the tree and many are buzzing in the air. Here’s a closer look as the swarm continues to grow as the bees collect around the queen. 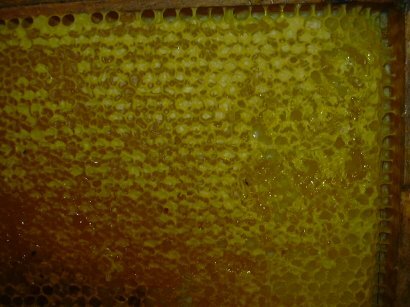 Another close-up of the main swarm body as it begins to elongate. Even more bees coming in to make the swarm even bigger. 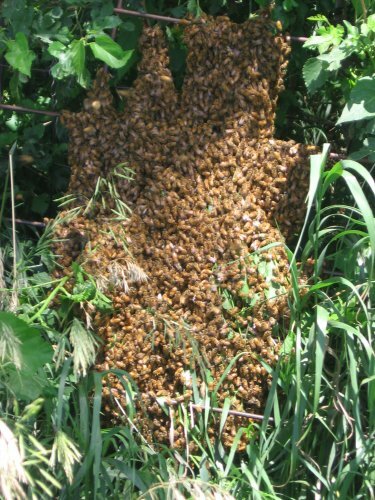 Finally, the swarm is at relative rest and all the bees that swarmed are in a mass. 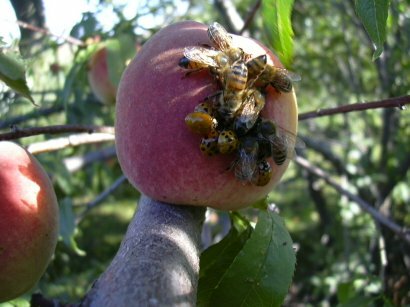 It is quite an experience to see this phenomenon of nature and hear the incredible buzzing as they were swarming! 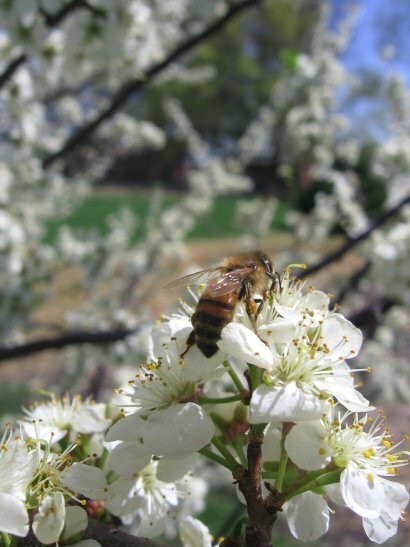 May 4, 2005 – Busy as a Bee! 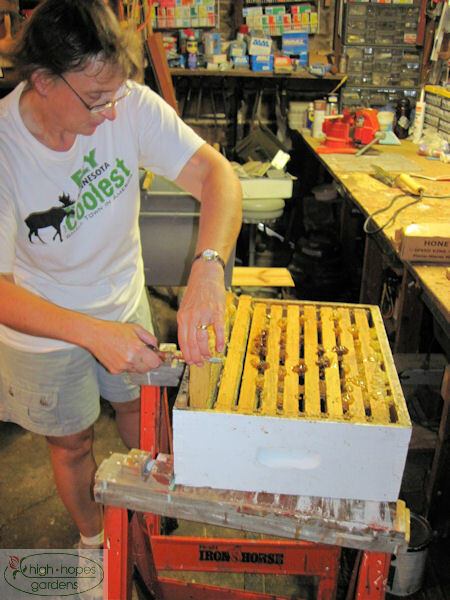 Mother-in-law Joanne has picked up the beekeeping torch. It was one of those things we always wanted to do – and had much of the equipment – but never had the time and thought energy to do it. 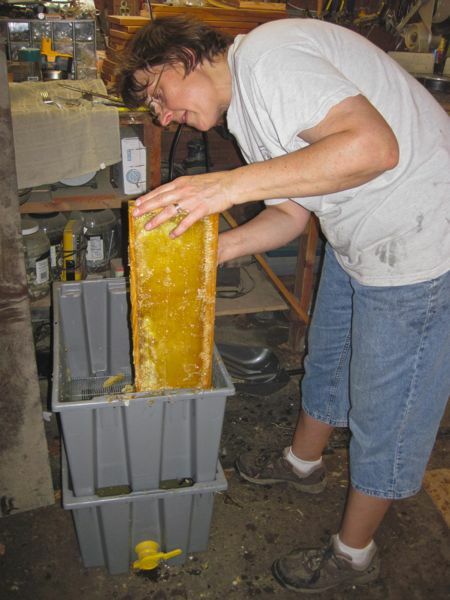 She is ready to set up 4 hives, with the bees coming any day now. Today and the last few days was a flurry of painting, constructing, etc. before the bees arrive. 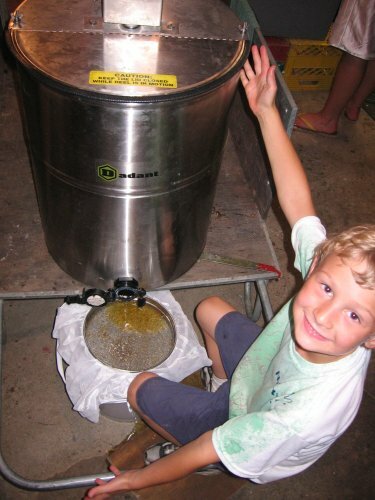 We greatly look forward to the honey and the pollination. The upper 60’s seemed like a heatwave today. Lots of little things got done – tore apart an old gate made of wood and hog panel, finished watering the hardwoods for the first time, picked up the rest of the mulch that was dying for bedding, mowed the sheep pasture to keep the grass tender for the sheep who have yet to arrive, replaced one of the peach trees that died over the winter, started tearing apart the old trailer for refurbishing, got a row of beans planted and some gourds over this arch made out of a cattle panel that spans an unused portion of the garden where the poles are that will be used to construct grape trellises some day.